Bintan Lagoon Resort Golf Club is a truly majestic championship course blessed with stunning views of the South China Sea. Why Bintan Lagoon Resort Golf Club is special ? Designed by the masterful "Golden Bear", the course offers majestic sculptured bunkers, a strategic use of the natural landscape and some unique water hazards. The Par 72 Jack Nicklaus Sea View Course measures 6443 meters with five different tee locations to suit golfers of all abilities. 12th Hole - A par 3, with a stunning backdrop of the South China Sea. Due to the high winds at certain times, club selection can be increased by at least four clubs, especially from the championship tees. 13th Hole - This par 4 has a unique feature of a split green, as one of the streams on the course runs through the middle. This makes it the most difficult and tricky hole on this course. 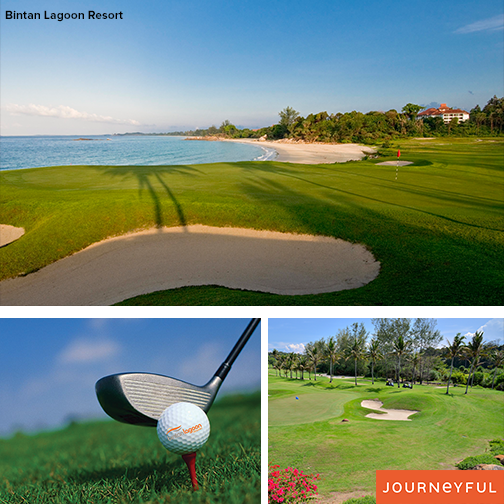 What to explore at Bintan Lagoon Resort Golf Club? One main attraction for tourists to Bintan are the island’s superb golf courses: wonderful facilities at reasonble prices. In Bintan Lagoon alone are two 18 hole golf courses : the Jack Nicklaus Sea View Course and the Ian Baker-Finch Woodlands Course. The Jack Nicklaus par72 Course measures 6,443 meters with 5 different tee locations to sit golfers of all abilities.Many of the tees are surrounded by steep slopes and mounds that create a stunning amphitheatre effect around many of the greens. Among the course highlights are: the elevated 8th hole tee at the 526-meter par 5 which is a favourite with many. Stretching downhill into the distance before rising to the green, it demands absolute precision from golfers who must negotiate their shots past bunkers, a lake and a solitary tall tree. The elevated 13th hole tee, presents golfers with an enticing vista of seaside villas and ocean. While the Ian Baker-Finch par 72 Course is designed with the front nine holes snaking out from the resort and the back nine to the clubhouse. It measures 6.211 meters with 5 different tee locations to suit any golfer. The 12th hole, a par 3, has a stunning backdrop of the South China Sea. The 13th hole, par 4, has a unique feature of a spilt green, as one of the streams on the course runs through the middle. This makes it the most difficult and challenging hole on this course. The 18th hole: is tough hole characterized by large bunkers and rolling mounds. 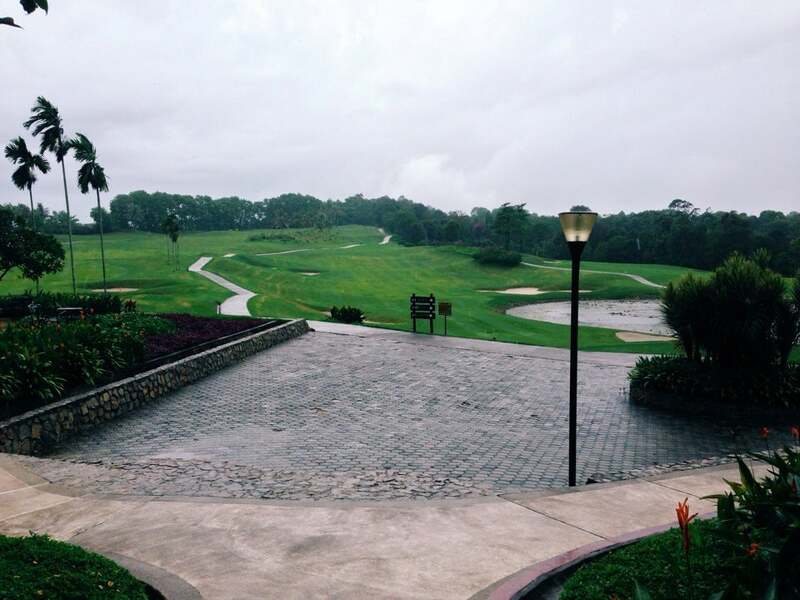 How to get to Bintan Lagoon Resort Golf Club? From Jakarta, capital of Indonesia, Bintan is served daily by Garuda Indonesia, Lion Air with Boeing 737-500 aircrafts and by Sriwijaya Air to the modern Raja Haji Fasibilillah Airport at Tanjung Pinang, capital of the province of Riau Islands. It takes 45 minutes by car from the airport at Kijang to reach Bintan Lagoon Resort. Although taxis are available, you can book at the Hotel to fetch you from the airport. From Singapore, the Bintan Lagoon Ferry has two departures from the Tanah Merah Ferry Terminal, namely at 09.00 and 16.00 hrs Singapore Time, , while departures from Bintan Lagoon are at 11.45 hrs (Fridays only), 13.00 hrs and 17.10 hrs West Indonesia Time. The journey from Singapore to Bintan Lagoon direct takes 75 minutes. Please note that during the rainy season when there are strong winds and high waves this ferry will not operate. The restaurant facing the golf course has equally a good view along with some indian choices. There is a wide variety of hole styles, with lots of different challenges in terms of both length of shots and strategy/course management. There is a superbly appointed Clubhouse, a Golf Pro Shop, Club and Shoe Rentals, Carts and Caddies, and a 31 bay covered driving range and putting green. Bintan Lagoon offers golfers two superb golf layouts - one by Jack Nicklaus and the other by Ian Baker-Finch. While the Nicklaus course is regarded as the easier layout, both are stern challenges. The service from the golf resort staff from hotel pick up to the caddie house was excellent. Again the local caddie proved invaluable with distance advice. The night before I was due to play, Bintan had very heavy rain for a considerable period. The courses were still playable on the next day. I played the Nicklaus course, which was very enjoyable. Many of the holes play from elevated tees and this provides a great view of the hole. While the 12th hole against the backdrop of the South China Sea is the signature hole, there are plenty of memorable holes. The long par fours 2nd and 9th are the pick of the holes on the front nine. On the back nine, the par 4 13th with a green that is divided by a creek, the par 3 15th with simialarities with the 16th at Augusta National and the closing hole a long par 4 stand out as fine holes. Worthy of a second round. Thanks for your vote if you found the review helpful.